What is "laundry footprint" or the carbon footprint of laundry? A lot of resources and energy go into washing our laundry. Washing and drying the laundry releases more than just dirt into the water and the environment: detergent chemicals and synthetic fragrances, genetically modified enzymes, carbon dioxide and microplastics. These factors as well as the amount of water determine the carbon footprint of doing the laundry. Canadians are washing an estimated 3.8 billion loads of laundry per year, based on an average of 2 loads per person per week. This calculation does not include any commercial or institutional laundry done in hospitals, hotels, motels, B&B's, hair salons, etc. The amount of water used in Canadian households to wash the laundry in one year is 26 billion gallons of water. My estimate is based on an average of 2 loads of laundry per week per person, that is if all that laundry were being washed in high efficiency front load washing machines. Of course not all households have that type of washing machine, so my estimate is likely low. How much water is 26 billion gallons? 40,476 Olympic-sized swimming pools full. That's a lot of water being used for washing the laundry in Canada alone. No wonder our oceans are becoming polluted with microplastics. So what can you do to lower your laundry footprint? Don't wash clothes that are still virtually clean. Besides the obvious items like underwear and socks, does a pair of pants or even a top or sweater need to be washed after every wear? Likely not. Inspect the item for stains and use the smell-test before deciding to throw it in the laundry hamper after one wear. Your washing machine is a well-designed machine. It can handle full loads. Washing small or partial loads is inefficient. Even if your machine lets you manually adjust the amount of water for the load size, you're still using a fixed amount of electricity to run the machine. Combine large and small items to make a full load, taking care not to over-stuff the drum either. The items should not be tightly packed and the door should close easily. Getting the laundry clean is better than having to re-wash. Select a product that lists all ingredients, is 100% plant and mineral based, and has enough ingredients that actually get the laundry clean the fibers. Many websites are posting recipes for homemade laundry detergent, which is great, however, none of the recipes I've seen include an ingredient that stops the soil from reattaching to the clothes during the washing process, also known as anti-soil redeposition agent. Whether you use a powder detergent or a liquid, use a biodegradable concentrate that doesn't come in a pre-measured or pre-pressed pod. This allows you to reduce the amount you use if you have soft water or if you do need to occasionally wash a small load. If you use a conventional laundry detergent and believe it will all get removed in the sewage treatment plant, think again. Numbers provided by the federal government show that in 2017, municipalities reported 215 billion litres of raw sewage were spilled or leaked without being treated. That's 86,000 Olympic-sized swimming pools worth. How many plastic containers of laundry detergent do you go through in a year? Look for a product that comes in responsible packaging or even reused containers. Better yet, skip all those containers altogether and buy in bulk for one to two years. Although tempting, doing an extra rinse cycle is unnecessary and counter-productive if you have hard water. A good laundry detergent will contain water softening ingredients that work to combat the hard water minerals. Doing a second rinse will likely result in those hard water minerals re-attaching to your clean clothes and turn them dull and stiff. If you're still using conventional fabric softener or dryer sheets, consider what you're putting on your clothes: many harmful chemicals, including QUATS (quaternary ammonium compounds), benzyl acetate, A-Terpineol, and BPAs. Not to mention that these chemicals can have adverse effects on your health, they are harmful to the environment and contaminate the air. Your neighbour who might suffer from environmental sensitivity (ES) will feel nauseous from the fumes wafting out of your dryer vent. Instead, use 1/4 cup of vinegar in the rinse cycle. Vinegar has a similar effect as using fabric softener, without all those chemicals, plus it will help rinse away detergent residue or hard water minerals. Don't worry, your clothes will not smell like vinegar, and if you do wish to have scented laundry, just add a few drops of your favourite essential oil along with the vinegar. Wash the laundry with cold water as much as possible. Up to 90% of the energy used in the wash is spent heating the water. A hot wash/warm rinse cycle uses 4.5 kWh per load versus a cold wash/cold rinse cycle which uses only 0.3 kWh. The majority of your clothes should be washed with cold water, however, certain items that need to be sanitized should be washed in hot water, like dish towels, underwear and reusable cloth diapers, or if a family member has been sick. Add oxygen bleach to the wash. Remember to always follow the care label and regularly clean your washing machine to keep germs in check. If you do run a warm or hot wash cycle, always select the cold rinse instead of warm. 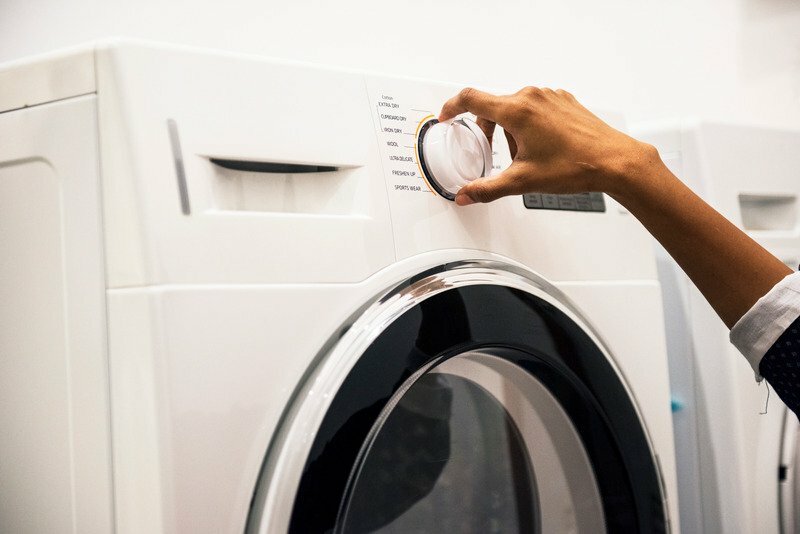 While in Canada with the long winter it may be impractical to ditch the tumble dryer altogether, using the dryer as little as possible will go a long way towards lowering the carbon footprint of washing the laundry. Air-drying your clothes can reduce your household’s carbon footprint by a whopping 1,000 kg a year. Use the free power of the sun and wind to dry your clothes as much as possible. Need to kill germs? Drying the laundry in the sun is still the best sure-fire and non-polluting method to get the job done. If I need a load of laundry to dry faster but still want to hang-dry the items, I will sometimes use an extra-long spin cycle, then put the washed load into the dryer for 15 minutes, and then hang the laundry to air-dry. The result is fluffier towels and shirts that are as smooth as though they've been ironed. Now if you must use the dryer, such as for sheets, bedding and pillows, use wool dryer balls to cut down on the drying time. Unless you live in Nova Scotia where your right to dry clothes outdoors is protected by law under the Clothesline Act, be sure to check the bylaws of your municipality before hanging a clothesline. Now you know how to reduce your laundry carbon footprint, one load at a time. Take pride in washing your laundry. I would love to see what city would try to fine anyone that is air drying their washing nowadays… I would say it’s hard for them to have blue and green bins and at the same time say it illegal to air dry washing. Wow. No idea about the bylaws.